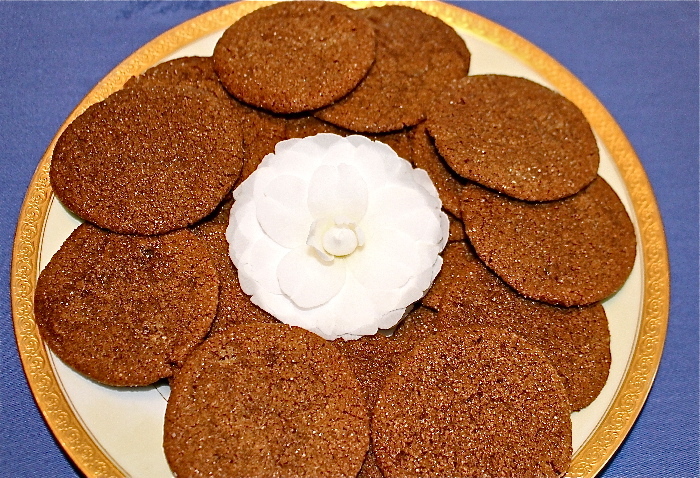 If you are a ginger snap or spicy cookie fan, look no further. A wonderful contribution to holiday platters, these cookies make great gifts and are perfect for a quiet evening at home, cozied up by the fireplace with a nice cup of tea. A favorite among my family, is Trader Joe’s Pumpkin Spread – A cream cheese mixed with pumpkin pie spice, that is only available between October and January. Used as the filling in Stuffed French Toast, it’s divine, and certainly earns it’s place at the holiday table! Spicy Watermelon is a favorite Latin American treat, among kids and adults alike. The lime and spices awaken the senses while simultaneously bringing out the sweetness of the watermelon for a delightfully refreshing flavor pop! In this recipe we’ve added ground vanilla beans which enhances the entire experience. Nectarines have such a delightfully tangy flavor, and it wouldn’t be summer without the juice of one running down your arm – it’s always sad to see the season end. One way to prolong your enjoyment of this summer fruit is to freeze them into luscious nectarine sherbet. *Note – Allow 2 days preparation before planning to serve. One night to freeze the freezer bowl and one night for the sherbet to ripen. Want dessert and a delicious pick-me-up? Have a coffee milkshake! It’s the perfect refreshing end to a late afternoon or evening barbecue on a warm — or sweltering — summer evening, especially if you plan to go to the theater, dancing, or just hang out and visit, maybe even watch the annual meteor shower. This decadent Hot Fudge recipe, from Gourmet Magazine, is everything you’d expect from this traditional favorite dessert topping. Chewy and gooey, smooth and shiny, it’ll dress up everything from your hot fudge sundae to your cakes and brownies. Perfect served hot over ice-cream or even just a chilled spoonful, straight from the jar, it’s sure to become a household favorite. 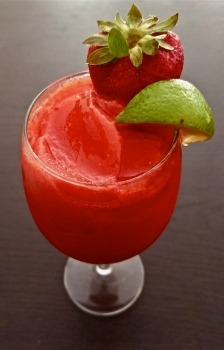 Strawberry Daiquiri’s are refreshing and delicious and with all the fresh berries available in summer, so easy to make! Vanilla is still America’s favorite Ice Cream flavor, which comes as no surprise to us! According to Food & Wine magazine, to celebrate July being National Ice Cream Month, the International Dairy Foods Association conducted a survey, which found Vanilla and Chocolate to be the two top sellers, in that order. Strawberry is the top fruit flavor, so we’re pretty sure you’ll be pleased with our deliciously refreshing recipe for Strawberry Ice Cream! Want to enhance a classic Mule? Add Vanilla to it! Spicy, tangy and refreshing, The Mule, with its hint of mint and twist of lime is the perfect way to cool off after a hot summer’s day. Love lime and ginger but don’t drink alcohol? No problem. Simply leave it out and enjoy this refreshing beverage without. While there seems to be some debate regarding the origin of their name, which you can read more about here, there is no debate that Lamingtons are a favorite treat among Australians – So much so that they have a full day dedicated to them – July 21st! We found them to be such a clever way to repurpose left over pound cake or sponge cake that you no longer have to go down under to enjoy this adorable little treat. Enjoy these tasty morsels of chocolate and coconut dipped confection in July or any other time of the year. Tiny bite sized cakes, they’re perfect for tea or an after supper sweet. These decadent brownies are incredibly moist and fudgy. With the marshmallow, chocolate and walnut topping, they are more like a candy than cookie/brownie bar. Whatever you choose to call them, they are a show stopper and are sure to please a crowd! The Mint Julep has long been associated with the south, but is thought to have gotten it’s roots centuries ago in the Arab world, as the Julab. Now it’s most famously associated with the Kentucky Derby. Regardless of where you reside, you can enjoy a Mint Julep in the comfort of your own home, with or without your derby hat. Mojito Bars are the adult version of their kid friendly cousin, the Lemon Bar, and will jazz up the dessert table at your late summer night party. Cool and tangy they pack a punch and will delight your guests with their flavorful zest! Flo Braker is a fabulous baker and her book Baking for All Occasions is filled with wonderful creations. One of our all time favorites, which is a hit with everyone who tries it, is her Tangy Lemon Custard Tart with Pomegranate Gelee. Decorate the top with halved cherries and blueberries and it makes a perfect dessert for the Fourth of July, but don’t be limited to these fruits; use any stone fruits you’d like! This Caramel Peanut Popcorn has been a family favorite for years. If you grew up loving Cracker Jacks, you’re going to love this crunchy treat. It makes a great gift over the holidays, or is delicious as a light snack any time of the year. This rich, creamy, dense flourless chocolate cake serves as a perfect dish for Passover Seder. A little goes a long way, so it can easily feed a crowd, but it also keeps well for left overs. A delightful dessert for those on a gluten free diet, this cake is versatile and delicious. Don’t expect leftovers unless you are four or less enjoying this cake. It’s exceptionally good! This decadent rich cake can be served throughout the year but is perfect for welcoming Spring. You can enjoy it with or without the frosting or chocolate honeycomb, or you can serve it plain with a dusting of powdered sugar. As strawberries become available, enjoy it with a big of caramel topping or whipped cream and sliced berries. Any way you serve it, it will be enjoyed! While these deliciously crunchy candies do not actually contain honey, the bubbles that give them their light air airy texture and their deep golden color, conjure up images of bees and nature’s sweet treat. Perfect for topping cakes and desserts or just served on their own, we think you’ll be pleased with their surprising texture and rich flavor. These rich, chocolaty spice bars are delicious year round, but are particularly comforting curled up next to a fire with a good book and a strong cup of tea! This time of year it’s impossible to miss all the cute Girl Scouts selling their cookies on every corner, and no cookie sells better than the traditional Thin Mints. While the Girl Scouts are starting to offer gluten free options, not all of the girls carry them and they’re not yet available in every variety of cookie. We think these Gluten Free Chocolate Peppermint Crisps, are a good runner up to this American classic, and when you make them at home you can enjoy them year ’round!